Every year around this time, there’s a pretty vigorous debate among my colleagues as to what to do for Halloween “treats.” We spend 364 days a year educating people about the evils of sugar, working to balance blood sugar dysregulation, fighting insulin resistance/metabolic syndrome/diabetes, combating inflammation, and healing digestive and hormonal systems. So, how can we in good conscience give children–who are the fastest-growing obese sub-population in the country–CANDY, one day a year? Some say, It’s one day a year, lighten up. Others say, There’s no point in fighting, they’re just going to get tons of candy everywhere else. Still others insist, The way to promote change is to lead by example. Personally, I choose to do a bit of both. I do hand out candy. But I also have alternative treats for kids who might want something else, or who have allergies or special dietary needs. Glow in the dark bracelets are always popular. I don’t love handing out candy, but I do make a point to buy candy that isn’t full of artificial colors and flavors and chemicals. 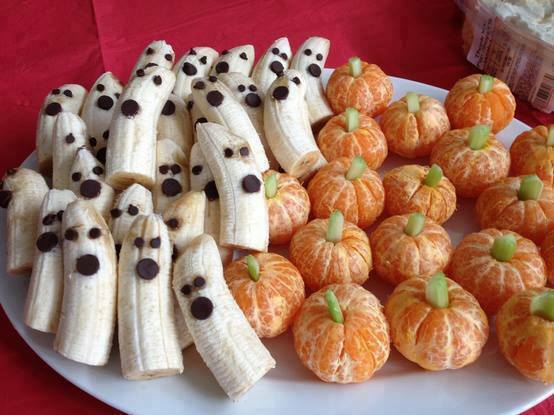 If you’re having a party, there are tons of great ideas for spooky-yet-healthy Halloween treats online. I really like this roundup of recipes. Also, check out these adorable goodies! 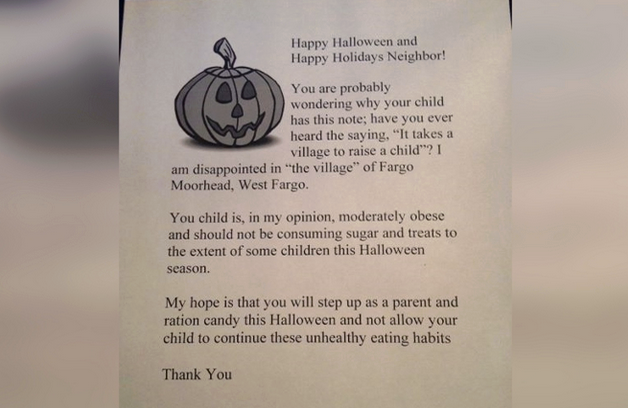 However you decide to balance healthy eating with Halloween fun this year, here’s one way I would definitely recommend NOT going about it! Good grief, what a cruel note to hand to anyone. Lots of judging there, too. Where did you find this? We gave out pretzels last year and they were a hit. We have close to 300 kids knock on our door Halloween night. It’s quite the experience. This time last year I did my own thirty-day, no candy challenge and it worked. I didn’t touch any of it. I’m on track so far this year too. I know Alys, such a terrible note from a thoughtless person! We get about 100+ kids each year, it’s such a fun night. For us too! Ah to be three again and full of delight and wonder.